For this new card design I wanted to use two tones of the same colour, so I went for a paler hue and a mid-hue on the baby’s feet, hearts and font colours. 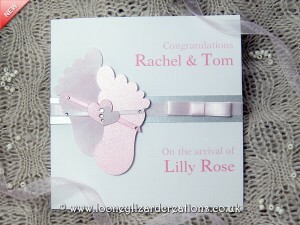 To create additional interest to this cute and modern handmade card design, I introduced the patterned as well as the plain pearlescent board to both the feet and heart detail. Both baby’s feet are layered from the card to create depth. The small heart detail that I created in the middle which nicely follows the curve of the baby’s foot was created to symbolise each parents love for their child and each other hence the entwined hearts. 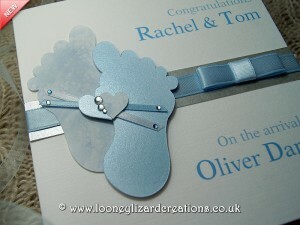 As with most of my designs I like to add a touch of silver which is used to help ‘lift’ the coloured ribbon from the card. To complete the design I have added some ‘bling’ to the entwined hearts and criss-crossed ribbon ends to add additional interest. So there you have it, a card to be cherished for years to come with your own personal message of baby’s arrival into the world. Now I wish I just had someone to send one to! As always I’m happy to hear your thoughts and options on the new addition to the Looney Lizard family!